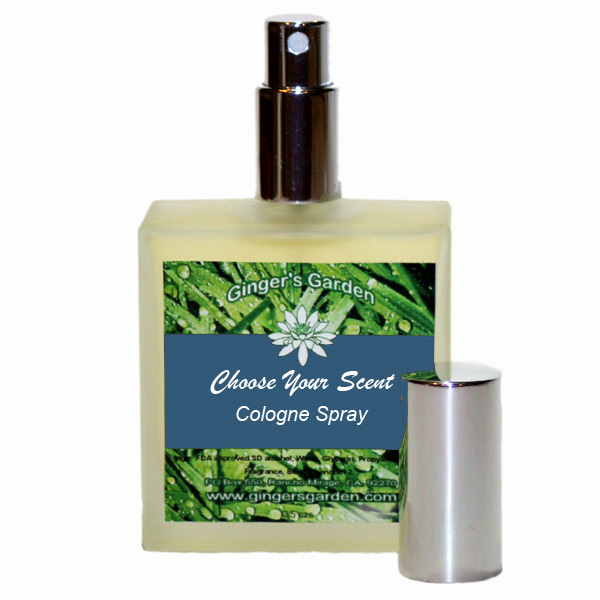 Ginger's Garden Artisan Natural Cologne Spray for men. Choose your fragrance, scent or essential oil from the extensive Scent List. Ginger's Garden Artisan Natural Cologne Spray is made for the discriminating gentleman that prefers an artisan based cologne spray. Each one is unique. Choose any fragrance or essential oil that's available on the Scent List and put your scent choice in the comments section of the shopping cart. Each 3.5 oz. bottle is a handsome, thick, square shape, frosted glass bottle with a silver sprayer and overcap. NOTE: Choose your scent from the Scent List available at the top of the HOME page, then type your choice in the comments section of the shopping cart when you check out. Ingr: FDA approved alcohol, Water, Glycerin, Propylene Glycol, Essential Oil blend or Fragrance, Benzophenone -2, Polysorbate 20.